CUSTOM Hand Stamped Teaspoon The ORIGINAL Hand Stamped Vintage Coffee and Espresso Spoons™ by Sycamore Hill, Since 2010. 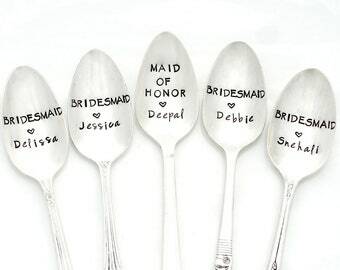 Spoons. Silverware. CURRENT PRODUCTION TIME: 1-3 Business Days, EXCLUDING The Love & Luck Horseshoe™ Collection, which is currently THIRTY (30) days. Please note that the production schedule DOES NOT include shipping time, which is usually 2-5 days. All items are shipped via U.S. Postal Service. Please contact me PRIOR to ordering if you have a specific deadline. All custom orders will be confirmed via the Etsy convo system within 48 hours of date of order. AS SEEN ON ... THE TODAY SHOW with Kathie Lee & Hoda, The FOOD Network, BRIDES Magazine, Good Housekeeping, Southern Weddings, Huffington Post, Serious Eats and Relish Magazine. Collections offered in collaboration with Juliska, Free People and Maker's Mark. 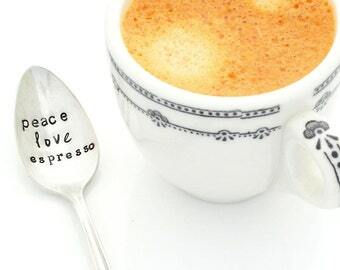 It all began in 2009, with the creation of The ORIGINAL Hand Stamped Vintage Coffee Spoon™ by Kelly Galanos. Launched online in 2010, the response was overwhelming! 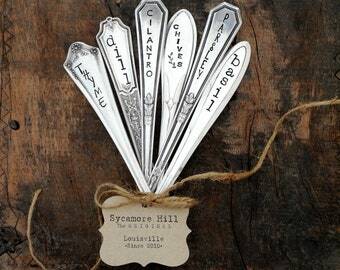 The Sycamore Hill Collection started a hand stamped vintage flatware trend that spread nationally, as well as internationally! With sales in 28 countries to date, The Sycamore Hill Collection continues to grow and expand with new product lines. With its unique and always original product designs, Sycamore Hill is a trendsetter specializing in custom, handmade gifts and home decor. 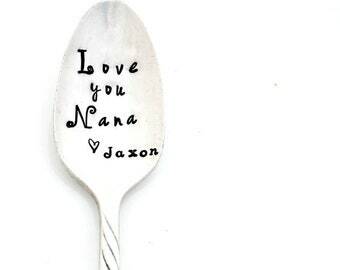 Vintage flatware hand stamped with messages of love, humor and inspiration. © 2010-2019 KK Designs LLC. All rights reserved. Mom, Can We Keep Him PUPPY Pawposal. He Wants to Know If You Will Say Yes. 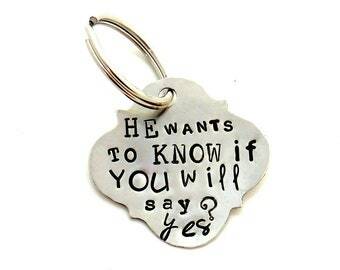 Hand Stamped Metal Pet Tag. Marry Me. Unique Dog Proposal Idea. MOM Since with YEAR or DATE. New Mom Gift. New Grandmother gift idea. 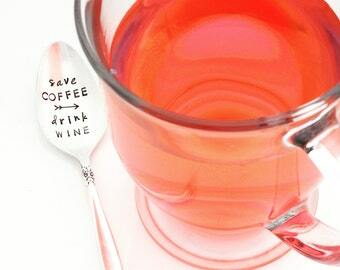 Hand Stamped Coffee or Tea Spoon. 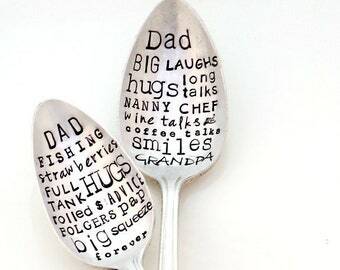 Personalized Grandparent Gift. 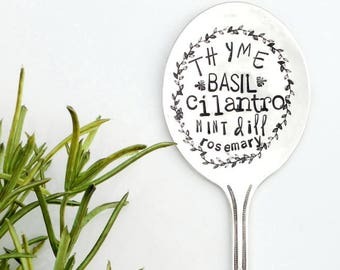 Cocktail Recipe Herb Garden Marker. Herb Stake for Potted Garden. Hand Stamped in Sycamore Hill's Signature Poster Art Style Fonts. 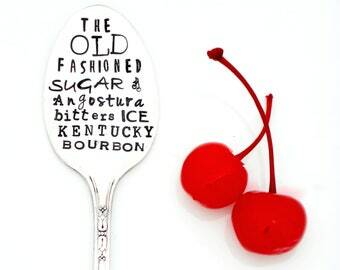 The ORIGINAL Subway Poster Art Style Spoon™ Cocktail Recipe Stirrer Spoon by Sycamore Hill. 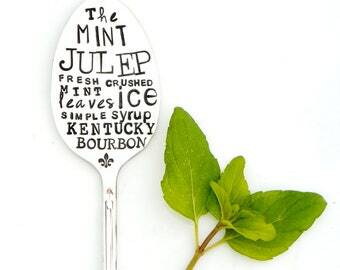 The MINT JULEP recipe spoon. Southern Charm. She's Bourbon in a coffee mug! 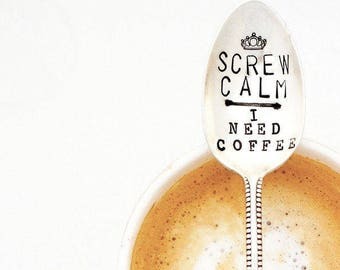 The ORIGINAL Hand Stamped Vintage Coffee Spoons by Sycamore Hill. Bourbon and Coffee Lover gift. BFF gift. 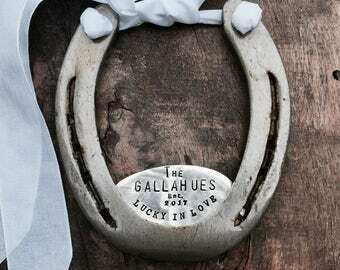 The CUSTOM Love & Luck Horseshoe™ Personalized Equestrian Decor for Your Home. Perfect Wedding Gift for Blended Family. Equestrian Style. 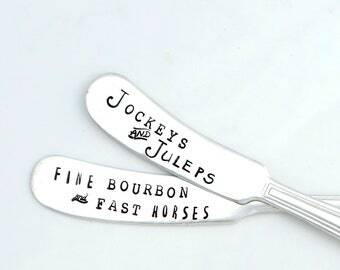 Jockeys and Juleps Hand Stamped Vintage Spreader. Cheese Knife. Unique Kentucky Derby Hostess Gift. Kentucky Derby Party Theme Tabletop. Potted Herb Garden Marker. Hand Stamped Vintage Spoon Herb and Vegetable Garden Markers. Urban Garden Gift. Deck Herb Garden. Herb Garden. INTERNATIONAL Shipping PUPPY PROPOSAL. He Wants to Know If You Will Say Yes. 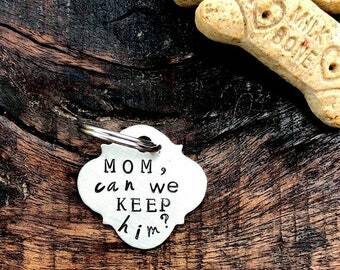 Hand Stamped Metal Pet Tag. Unique Proposal Idea. Marry Me. 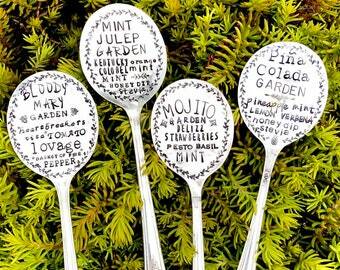 The Subway Poster Art Style Hand Stamped Spoons™ ORIGINAL Designs by Kelly Galanos for Sycamore Hill. Personalized with memories and places. 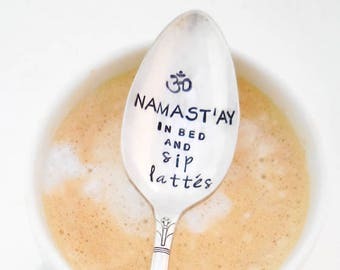 Namast'ay in Bed and SIP LATTEs Stamped Teaspoon. 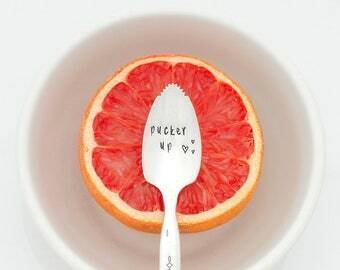 Namaste Hand Stamped Spoon. ORIGINAL Design. Gift for Yoga Practitioner. Gift for Yogi. 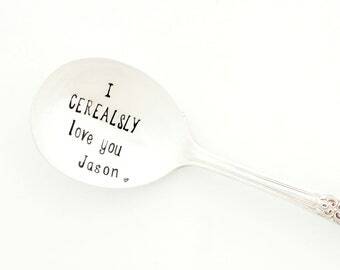 mornin' STUD hand stamped spoon. 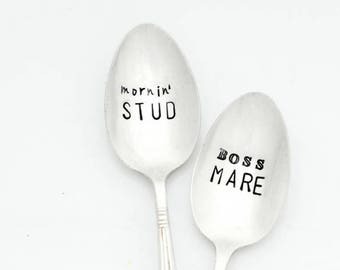 Boss Mare Hand Stamped Teaspoon. Unique Gift for Horse Show Dad, Barn Dad, Horse Mom or Riding Instructor. Have a Sip and Meet Me at the Altar! 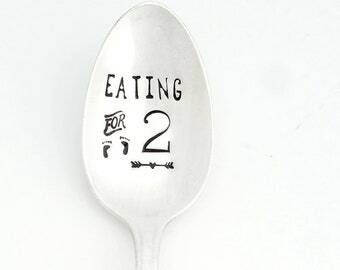 You choose wording for your wedding day. CUSTOM PERSONALIZED Bottle Tag, Wedding Day Gift for Groom. Love these! They are well made. Perfect addition to your Derby display or bar cart. I love it!! 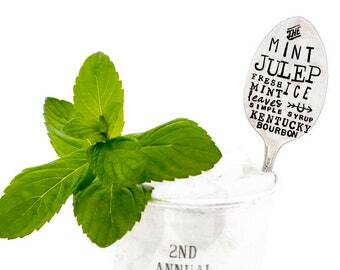 You're The Mint to my Julep Stamped MINT JULEP Spoon. Choose Tall Iced Teaspoon or Teaspoon Size. 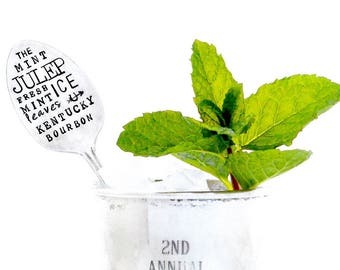 Kentucky Derby Party Hostess Gift Idea. What a milestone! The perfect gift to commemorate a marriage of 50 years ~ it truly is made of iron!! Aren’t these absolutely BRILLIANT! Cheers to the weekend and to Cocktail Gardening!! 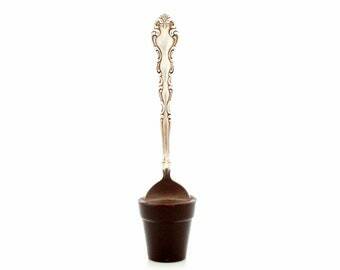 It all began with this gorgeous espresso spoon, stamped XO as a gift ~ my "Aha Moment" ~ and the collection was born. A box of vintage stamps, a very old hammer & "coffee love" led to my creation of a completely ORIGINAL product line. It all began in 2009, when I came across the most exquisite espresso spoon I had ever seen while together on one of our many antiquing trips. That little spoon and our shared love of coffee (her delicious espresso to be exact), inspired me to hand stamp a gift for my treasured friend, Maria. This tiny gift, lovingly created, would go on to inspire an entire ORIGINAL product line! 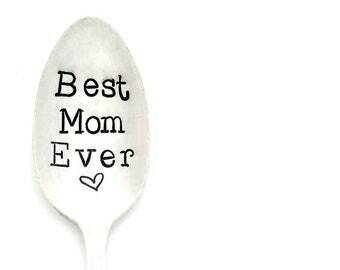 The very first pieces made were spoons from my personal collection. With the encouragement and support of my family, The Original Hand Stamped Vintage Coffee & Espresso Spoons™ Collection was launched. I began selling in local retail shops and the response was overwhelming ~ I could not restock fast enough! I knew there was nothing like it on the market! Not long after, I was introduced to Etsy and decided to offer the collection online. So happy I did! 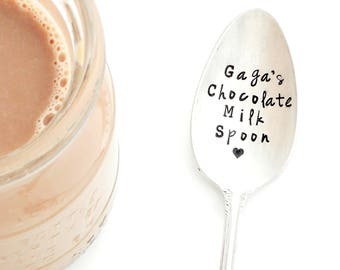 The ORIGINAL Hand Stamped Vintage Coffee Spoon™ sold the same day my shop went live on August 5, 2010! The sales did not stop! A concept so unique and so original, it developed into a full-time career upon launching. It was an unbelievable feeling! The decision to open my shop was life-changing! Etsy has been an amazing platform for my business and I am grateful for the national and international exposure it has provided my ever-expanding ORIGINAL product line. As a sentimental soul, making personalized, one-of-a-kind pieces for others is my passion. I am a giver by nature and my designs are inspired by those in my life close to my heart, and my clients and their life stories that bring us together. What I create goes far beyond the fonts, words and silver patterns by the original artists I admire so deeply ~ these little handled bowls connect people and are daily reminders of love and special memories. Everything I make is inspired by a relationship. I feel honored to have been instrumental in many proposals of marriage, announcements of babies to come, apologies long overdue, and encouraging those recovering from eating disorders to heal their relationship with food, through the nourishing, affirming words of those who love them. I am beyond blessed to have a business that is so rewarding and brings me in touch with people from all over the world ~ 28 countries to date and counting, with one common goal: Designing and making a gift that will be cherished for what it represents, whether it is truth, love, an inside joke between friends or straight up in-your-face sarcasm! As long as it is an Original Sycamore Hill creation, presented in the brand’s elegant and organic style, it will become an instant treasure! Sycamore Hill “the shop” was named after the "real life" Sycamore Hill ~ our gorgeous Louisville property situated among the rolling hills of Bluegrass horse country. My studio on the Hill overlooks the century-old tree after which our property is named. I am Blessed with quite an incredible view! Thank you for visiting! The Sycamore Hill Collection started a hand stamped vintage flatware trend that spread nationally, as well as internationally! The Sycamore Hill Collection continues to grow and expand with new, and always original, product lines. With its unique, one-of-a-kind designs, Sycamore Hill is a trendsetter specializing in custom, handmade gifts and home decor. The Love Sweet Love Collection™ was blessed with a feature in BRIDES Magazine (January 2011), six months after opening my shop, and it has been a fantastic journey ever since! 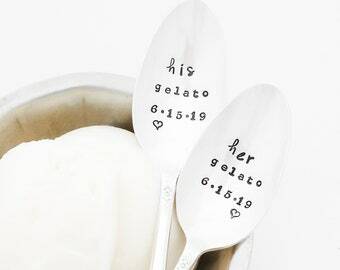 Beautiful wedding-inspired designs that will create an instant heirloom for you and your love. A Uniquely Set Table™ ~ A collection of original serving piece designs for every facet of entertaining. This collection will have you hosting in style, with flair ~ from appetizers through dessert. The Bottle Tag Collection ~ The Riveted Series™ ~ A collection of custom bottle tags perfect for milestone events, home bars, man caves and weddings. The Groom’s Bottle Tag ~ “Have a Sip and Meet Me at the Altar” is a best seller and the perfect gift and keepsake for the future Mr. Right. 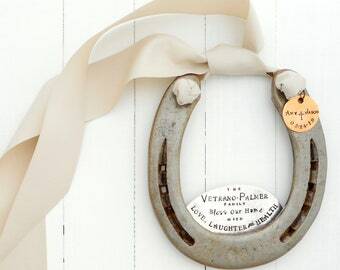 The Love & Luck Horseshoe™ ~ Handcrafted of upcycled vintage silver and reclaimed hand-forged iron shoes previously worn by local Kentucky horses., this charming display creates an earthy and organic welcome. A beautiful, rustic housewarming gift with Southern charm, as well as equestrian style and tradition. Cellar Door Chocolates is Louisville's premier chocolatier & official chocolate sponsor of The Emmys for years 2014, 2015 & 2016! Owner Erika Chavez-Graziano has built Cellar Door’s reputation on her handmade truffles, buttercreams, sea salt caramels and wide selection of other treats. The Sycamore Hill Collection of unique hand stamped vintage tabletop pieces will have you entertaining in style, with flair, from appetizers through desserts ~ not to mention a little bit of everything in between for your home and garden! The originality of my designs and style of my handmade work is signature to the Sycamore Hill brand. The quality and workmanship of my collection is unmatched. I take great pride in my creations and the unique product line I've created. 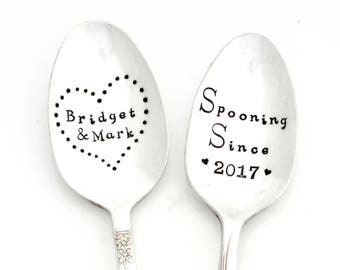 I spend time with each of my clients to ensure that they have created a custom piece in the silver pattern of their choice, as well as font and layout. I have over 100 different patterns in stock at all times, and the selections are as varied as the collection is extensive. I have been collecting silver for years ~ it's my passion! If you do not see what it is you are looking for, or have simply have an idea for a custom item, please contact me. Custom orders are welcomed and encouraged! Together we will create the perfect piece! 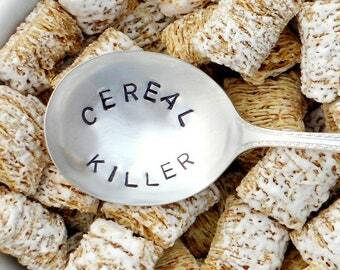 It all began in 2009, with the creation of The ORIGINAL Hand Stamped Vintage Coffee Spoon™ by Kelly Galanos. Launched online in 2010, the response was overwhelming! 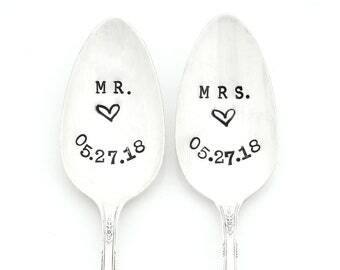 The Sycamore Hill Collection started a hand stamped vintage flatware trend that spread nationally, as well as internationally! With sales in 28 countries to date. The Sycamore Hill Collection continues to grow and expand with new product lines. With its unique, original designs, Sycamore Hill is a trendsetter specializing in custom, handmade gifts and home decor. Each and every item in the Sycamore Hill Collection will arrive beautifully and organically wrapped in the Sycamore Hill signature style ready for gifting. You will be very pleased to present your Sycamore Hill gift. Handmade, personalized gift notes are available upon request and are also at no additional cost. It's a Sycamore Hill thing! Please contact me prior to ordering for instructions on purchasing gift boxes. Please contact me if you have any questions or special requests for gifting. A great portion of my business is generated by Sycamore Hill customer referrals. I want each and every one of my customers to adore their purchase! If for any reason you are not absolutely satisfied with my work, please let me know upon receipt. I believe that anything can be resolved smoothly with great communication. If for any reason you wish to return an NON-CUSTOM item, please be sure to NOTIFY me within three (3) days of receipt. I will happily accommodate you by issuing a complete refund, less shipping, so long as the item has not been used, and is returned in the same condition it was received. If the item has an error, typo or any other mistake that is MY fault, I will immediately issue a replacement and a postage paid envelope for the return of the incorrect item; or, issue a full refund, including shipping, depending on the circumstances. Honestly, mistakes rarely happen, but if and when they do, I want to correct the item as quickly as possible! On the fourth (4th) day, I will assume that you are pleased and the purchase becomes final. CONFIRMATION OF DELIVERY. I rely on USPS Tracking™ for Delivery Confirmation as proof of delivery. If you have an issue with the delivery of an order that has been CONFIRMED delivered through the USPS Tracking™, you will need to contact the local USPS branch for the city of delivery. I CANNOT BE HELD RESPONSIBLE for deliveries being misplaced after time of delivery. PayPal is the preferred method of payment for Sycamore Hill purchases. Paypal ensures a safe and secure transaction, as well as timely receipt of your purchase. You may also make a credit card payment through Etsy's direct check-out. Personal Checks are also accepted. Please be aware that there will be a delay in shipping of your item, as I must wait until your check clears your bank, before your item will be packaged and shipped. I use the Etsy convo system to reach customers to confirm orders, usually within 24-48 hours. I will also use the convo system to ask questions to clarify any matters prior to beginning work. It is important to have your current email associated with your ETSY account. Please be aware that I do not make individual phone calls to clients, even if a number is left in the NOTE TO SELLER. If my questions/convos (emails) go unanswered for more than 10 days, your order may be cancelled and refunded. Sycamore Hill is not responsible for any taxes or duties that may be incurred. This is the buyer's responsibility. All purchases are shipped via USPS First Class Mail and Priority Mail. Please contact me prior to purchase if you are in need of an overnight, expedited or alternate shipping method. I rely on the the USPS Delivery Confirmation as proof that your package has reached it's destination. Delivery confirmation is included in your shipping costs; however, if you wish to purchase additional services, such as insurance, please contact me prior to placing an order so I can adjust the listing accordingly. Please be sure that your PayPal and/or Etsy account reflects the correct shipping address. I will ship to the address shown on your receipt. It is buyer's responsibility to update shipping information. I cannot be held responsible for items that are sent to incorrect or out-of-date addresses of record. You can easily check your address of record by viewing your Etsy receipt for the transaction. If there is an error, please notify me immediately, so that I am aware of the change. Please notify me directly if you wish to have your order shipped to another location, i.e. gift address, etc. Yes, I do ship Internationally. However, it is necessary that you contact me directly for information on cost of shipping and terms. Most often, I ship via INTERNATIONAL PRIORITY and the packages are received in a timely manner. However, delays in customs are always a possibility, therefore you should place your order well advance if you have a specific deadline, leaving plenty of time for shipping delays. Once a shipping method has been selected, I will set up a Reserved Listing. All items are vintage silver plate unless noted otherwise. 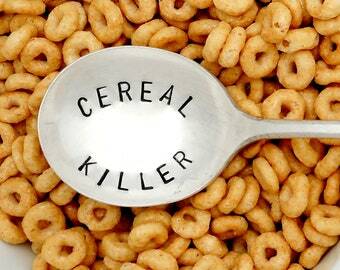 All items have been cleaned and are ready for use; and, of course, all items are food safe and all-weather. HAND WASH ONLY, please. Vintage silver was never meant for the extreme temps of the modern-day dishwasher. These pieces have graced the presence of many generations before us and in their new, upcycled form will carry on… gracing OUR homes and gardens for generations yet to come. 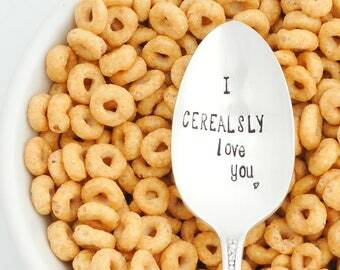 I hope you enjoy them often! CAN I CHOOSE FONT and SILVER PATTERN? SILVER PATTERN: What is the difference between FLORAL and NON-FLORAL? The silver pattern refers to the design of the handle of the flatware. Floral silver patterns will contain flowers, while non-floral will have some sort of design, without flowers; perhaps, flourishes or Art Deco geometric designs. If you want a very plain pattern or a specific look, please leave a NOTE TO SELLER at check out and I will be in touch with silver pattern selections from which to choose. Absolutely! The Sycamore Hill Collection™ has been shipped to 28 countries to date! Please contact me directly to receive a shipping quote and ordering instructions.